Feel like putting your creative flair to a test by designing your own running shoes? 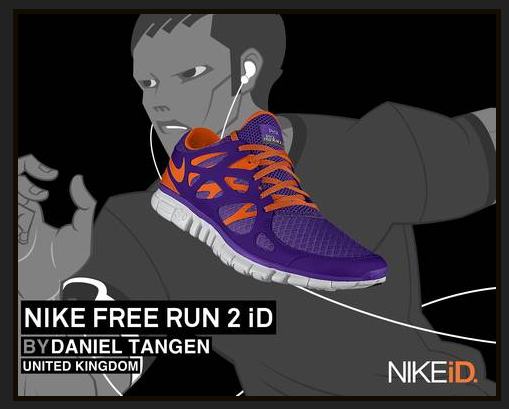 Well now you have the chance as Nike has launched a Nike Free Run 2iD design your own shoes application on Facebook. Those familiar with the design your own feature of Nike iD from their website will recognize the procedure. What Nike has done well with the application on Facebook is to have made it easy to share your designs with your friends and the wider Nike public on Facebook, with people being able to vote/like your design. Whilst i was testing the Facebook application the Nike Free Run 2iD were still not in sale, hence there was no link to the actual purchase of the shoes following finishing the design process. This has now changed (Thanks Todd at Nike for letting me know), and people who have created designs before the shoes became available have been notified by email with a link to purchase. Whether down the Facebook application or not, the shoes have become a big hit according to Nike. I have been trying to order mines myself, but they seem to have sold out in the 3.0 sole. In terms of potential social media success, i would say Nike has done a very good job. Here is the link to like my own design above.